For graduates and undergraduates in engineering. Chapter headings and selected subchapters: Prefaces. Introduction. Continuum theory. 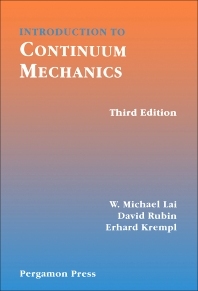 Contents of continuum mechanics. Tensors. Summation convention, dummy indices. Kronecker delta. Manipulations with the indicial notation. Tensor: a linear transformation. Dyadic product of two vectors. The dual vector of an antisymmetric tensor. Principal scalar invariants of a tensor. Tensor-valued functions of a scalar. Curl of a vector field. Polar coordinates. Kinematics of a Continuum. Description of motions of a continuum. Dilatation. Local rigid body displacements. Components of deformation tensors in other coordinates. Stress. Stress vector. Equations of motion written with respect to the reference configuration. Entropy inequality. The Elastic Solid. Mechanical properties. Linear elastic solid. Reflection of plane elastic waves. Stress concentration due to a small circular hole in a plate under tension. Constitutive equations for anisotropic elastic solid. Constitutive equation for an isotropic elastic solid. Change of frame. Bending of an incompressible rectangular bar. Newtonian Viscous Fluids. Fluids. Streamline, pathline, streakline, steady, unsteady, laminar and turbulent flow. Irrotational flows as solutions of Navier-Stokes equation. One-dimensional flow of a compressible fluid. Integral Formulation of General Principles. Green's theorem. Principle of moment of momentum. Non-Newtonian Fluids. Linear Maxwell fluid. Current configuration as reference configuration. Special single integral type nonlinear constitutive equations. Viscometric flow. Answers to problems. Index.